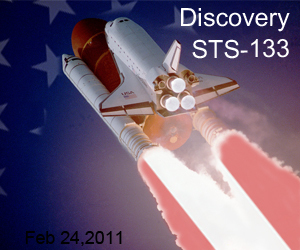 We missed the opportunity to watch a live shuttle launch while visiting Florida for Lotusphere 2011. The mission was delayed, but today Discovery launched. If you have never had the thrill of watching it in person, I can tell you it’s an amazing thing. Growing up in Tampa, I had the privilege of watching the launches from my back yard. Yes, from Tampa, 100 miles away! I can remember watching Columbia, the very first mission, launch in 1981. I can also remember watching Challenger. While I could not be there for the launch in person today, thanks to the Internet and streaming HDTV, I had the best view possible without being there. Check out the ongoing live video stream of the shuttle mission. You can also get cool images and information at the NASA website. In honor of the few remaining shuttle missions (the program ends in 2011), I used it as the theme for these images in a project I’m working on.